The Gauntlet is one of my favorite flag pulling drills. During the drill, one defensive player will attempt to pull the flags of the rest of the team, one by one. You only need four cones to set up the drill. When setting up the area, I usually make the starting gates about 5 yards wide and have the defense start about 10 yards from the offense. When you start the drill have the defense start between the two cones and instruct them that they need to work forward attacking each offensive player. I use “Go!” in most my drills. Once you have the defense set and the offensive players in a single file line at the other side, send the first runner. Once the defense has pulled the flag or the offense has gotten past, send the next runner. This drill has the potential to become congested. Stress with the offense to leave their pulled flags on the ground and wait until the drill is over to retrieve them. Under normal circumstances, I teach my kids to hand the flag back to the opponent. However, in this case, I tell them to just drop the flag and get ready for the next player. As the coach, you control the tempo. With your lesser skilled players, you can wait a little longer before sending the next the offensive player. With your better players, you can send the next player as soon as the flag is pulled. To make the drill competitive, keep track of the number of flag pulls each player gets and announce the current leader and total before each new defender. Though this drill is defense focused, as with any defense drill that involves the offense, your players can work on their running skill as well. Some of your kids will probably try to beat the defense by trying to juke them several times back and forth. Stress with your team that while this may work in this drill, in a real game situation, the slower you go allows the entire defense more time to swarm the offense. The runners should be doing one move or a quick double move or no move at all. This drill is an excellent time for kids to work on spin moves (if that is something you teach). Another reason I like this drill is that it is good conditioning for the defensive player. When you first run the drill (and depending on team size), it may take about a minute for one defensive player to face the rest of team, everyone retrieve flags, and get back in line ready for the next round. If you have a team of 10, initially plan for this drill to take about 10 minutes. You can split your team into 2 groups and run the drill with both groups going at the same time. However, I do not do this very often as I like the 30-40 seconds of conditioning the defense gets facing the whole team. 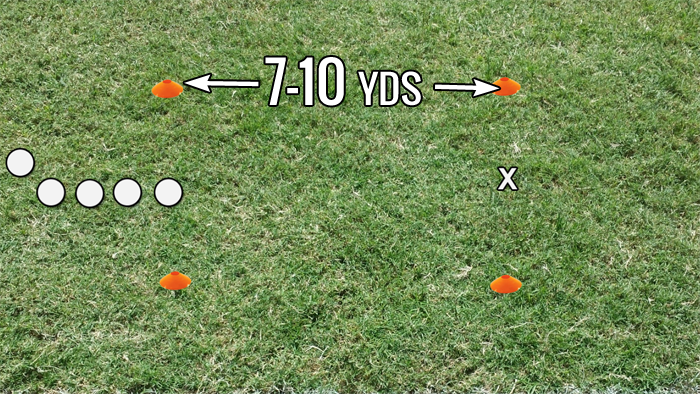 To add an additional goal to the drill as well as reinforce the concept that the defense needs to attack the offense, space the cones about 15-20 yards apart with the width still 5 yards. 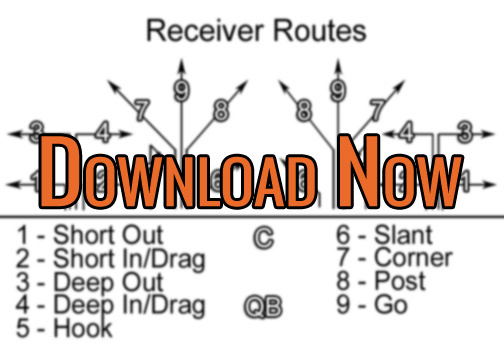 Place an additional two cones 5 yards from the where the offense starts. Tell the defense that the goal of the drill is to pull a flag in the zone. If during the drill, the defensive player misses a flag pull, have the defense move back two steps from the spot where the miss occurred.